The first step in most 3D projects is creating the objects. The most basic shapes are provided in MAXON CINEMA 4D as parametric primitives. Parametric objects can be converted to polygons to serve as a basis for more complex objects. A number of deformers and other generators can be used in conjunction with objects. Splines can be used as the basis for extrudes, lofts, lathes and sweeps - all of which can be adjusted dynamically in real-time, and even animated. CINEMA 4D's comprehensive polygon tools provide real-time feedback. A powerful Knife tool works in conjunction with N-gons to easily cut holes, planes and paths into objects. The Stitch and Sew tool makes it easy to close holes between objects. With the Brush and Magnet tools you can easily paint point deformations for more organic objects. Whether your scenes are real-world or out-of-this-world, CINEMA 4D's powerful modeling tools provide the building blocks for your imagination. MAXON's CINEMA 4D features an arsenal of UV editing solutions that ensure your models and their materials line up properly. UV coordinates are essential to successful painting and quality texturing in 3D. Whether adjusting UVs for a low-res game model or a high-res matte painting, CINEMA 4D provides the UV tools you can count on when the UV mapping is not as perfect as the model. Whether it's artificial or natural materials you are creating, CINEMA 4D's material system provides incredible control over the surface properties of your 3D objects. The basis for most channels is a texture or shader. For textures, CINEMA 4D supports most popular image formats, including layered PSD files. A wide range of 2D and 3D volumetric shaders make it easy to create procedural surfaces and easily simulate glass, wood or metal. With filter and layer shaders you can easily combine images, shaders and filter effects. MAXON's CINEMA 4D offers the ultimate control over your textures with complete layer, filter and tablet support - all optimized for working in 3D. With CINEMA 4D you can paint on up to ten channels with a single stroke. A brush can define an entire material rather than a single color, and CINEMA 4D's exclusive RayBrush technology lets you view the results of your painting in real-time in a rendered image. CINEMA 4D's Projection Painting tool lets you paint across UV seams or even multiple objects in a scene. Projection Man revolutionizes the workflow for creating digital mattes, making it simple to set up an initial painting and even easier to patch the matte when necessary. Using CINEMA 4D's internal painting tools or Adobe Photoshop it's easy to edit and manipulate extensive digital mattes, making it possible to create extended, wild camera rides. Whether you're ballooning over a city, shooting through rapids, flying off cliffs or simply creating a basic set extension, you'll be amazed at the power and speed of the Projection Man matte painting workflow. Shift your scenes into the fourth dimension with MAXON's CINEMA 4D. Building professional 3D animation has never been easier and more intuitive. Virtually any object, material or tag parameter can be keyframed by simply clicking the circle next to its name. To make keyframing even simpler you can activate automatic keyframing of all or selected parameters. The Power Slider lets you quickly define keyframes for the current state at any frame and modify existing keyframes without leaving the default layout. When your pictures need to sync with audio you can import sound and view its waveform directly in the Timeline. Better yet, activate scrubbing and listen to your audio as you manipulate the time slider. For the ultimate syncronization, attach sounds to specific objects. CINEMA 4D even features an easy-to-use particle system. Any object can be used as a particle - such as geometry or lights. Particles can then be affected by various effects like gravity, turbulence, wind and many others to create stunning animations. CINEMA 4D offers a complete array of gaffer's tools so you can make your scene outshine the competition. Light up your scenes with CINEMA 4D's lighting system and produce outstanding results in little time with the built-in render engine. Various types of light and shadow calculations provide the basis for an extraordinarily powerful lighting system. Control color, brightness, falloff and other properties and adjust density and color of each light's shadows. You also can use Lumen or Candela brightness values for any light rather than using abstract percentage values. Create visible or volumetric lights with noise patterns that appear in the light cone. Lights offer settings such as contrast, lens reflexes, shadow color, volumetric light and noise, and many more. CINEMA 4D's outstanding renderer delivers great-looking results in short time thanks to its linear workflow, support for multiple processors, HyperThreading and Multi-Core technology. With CINEMA 4D's Multi-Pass rendering you can easily render color, shadow, reflection and other effects to individual files for tweaking using your favorite compositing application. Multiple object-based alpha channels make it easy to layer elements with other 2D and 3D assets. With direct export to Adobe Photoshop, Adobe After Effects, Final Cut Pro, Combustion, Shake, Fusion and Motion, your Multi-Pass layers will be ready to composite in no time. CINEMA 4D supports rendering in 16-bit and 32-bit color depth for high dynamics range images in DPX, HDRI or OpenEXR format. Furthermore, the support of color profiles makes sure your renderings appear as they should, no matter which device you're working with. Create eye-popping stereo 3D visuals using the complete stereoscopic workflow in CINEMA 4D Release 13. Easily convert existing projects or create new stereo scenes using a few simple camera settings, and preview the stereo effect within the Viewport. Render the merged image or individual channels and preview the stereo effect within CINEMA 4D’s Picture Viewer. A few simple settings convert any CINEMA 4D camera into a stereo rig. Simply enable one of the stereo modes, define the eye-separation and convergence, and choose between parallel, off-axis, on-axis or radial placement. Safe regions can be defined manually or defined automatically by CINEMA 4D. Preview stereo effects in real-time by enabling the Stereoscopic mode for any view. Stereo previews can be displayed in Anaglyph, Side-by-Side, Interlaced or Active Shutter mode for compatibility with a variety of 3D monitors, projectors and glasses. As a 3D artist you know that fast, easy workflow is the key to meeting deadlines and edging out the competition. Novices and professionals alike will appreciate the well-designed workflow that makes CINEMA 4D the easiest-to-learn professional 3D application. You can count on MAXON's technical support specialists to provide quick and free support by phone or email. CINEMA 4D's completely customizable interface lets you quickly re-design layouts, palettes and even menus to match your personal workflow. You can switch between layouts with the click of a button! 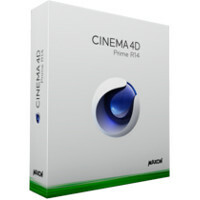 CINEMA 4D is also available in several languages. CINEMA 4D's Render Queue offers a powerful workflow for rendering multiple CINEMA 4D scenes on your computer. You can easily add scenes to the queue, change priorities, and even adjust which camera or render setting is used without opening the scene. CINEMA 4D's Picture Viewer makes a big difference. Besides letting you view pictures and full animations with sound, the Picture Viewer enables you to make minor adjustments such as controlling image contrast, brightness or saturation directly in CINEMA 4D using different filters without the need of time-consuming re-rendering. Fullscreen playback mode allows you to view your animations without distraction. When you aren't in fullscreen mode, the Navigator lets you easily move around large renderings. An RGB histogram gives precise information about the color and brightness of images, and the A/B mode allows you to compare renderings. "Man is not an island" and neither is MAXON's CINEMA 4D. Because real-world 3D artists do not work in a vacuum, CINEMA 4D includes support for a host of industry-standard file formats. CINEMA 4D renders passes in any desired format (image sequences, AVIs or QuickTime movies and many more) and creates a compositing project file that automatically brings all sequences together in the correct format. Depending on the compositing application used, additional data such as 3D cameras, 3D lights or reference objects will be exported as well. CINEMA 4D lets you fully customize nearly everything. From its easy-to-use node-based XPresso system to scripting with its own C.O.F.F.E.E. language or the widley acclaimed Python language or a complete C++ SDK. It's up to you! Build extensive relationships and add powerful interaction to your 3D scene with XPresso, CINEMA 4D's visual node-based drag & drop Expressions editor. XPresso is a tool that artists can use to intuitively create relationships between almost any object, material or effect parameter. Variables within your expressions can be linked to sliders in the Attribute Manager to create driven-key animation or complete slider-based interfaces to your 3D scene. Explore XPresso and discover the power of relational animation in CINEMA 4D. CINEMA 4D offers three options for programmers to create their own functionality: programming in C.O.F.F.E.E., a proprietary programming language; Python, a standard programming language; or C++ SDK.